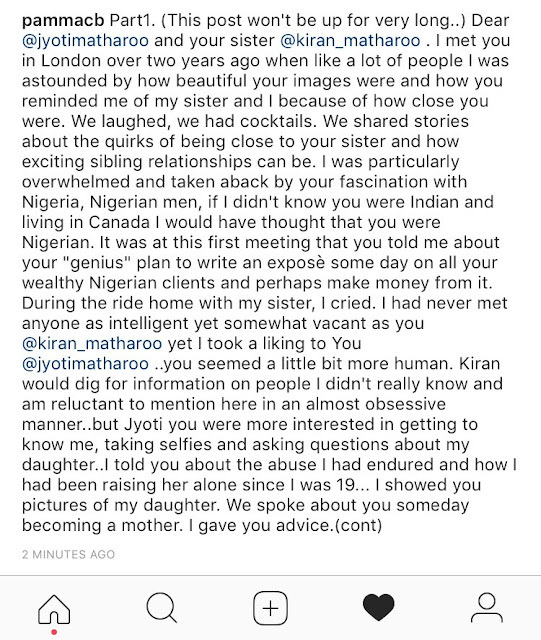 Looks like nemesis finally caught up with Canadian Indian sisters, Kiran and Jyoti Matharoo,they are infamous promiscuous sisters who allegedly have been with most of the super rich men in Africa and Nigeria especially.The girls were arrested for a scam that involves them blackmailing the men they have been with.They allegedly met their doom when they attempted to black mail billionaire Femi Otedola. I mean how stupid can you be?Why would you attempt to blackmail a billionaire?Do you know the resources at his disposal?I guess they had become so successful in their trade that they began to believe they were untouchable and could get anybody. A medium that the girls use is said to be Naijagistlive.A blog where they expose their clients who refuse to pay up. The high society sisters have long threatened the peace of Nigeria’s rich, spoilt wives, whose husbands patronized, coughed hundreds of thousands of dollars to grace their beds, have met their waterloo.In every nook and corner of the rich playground in Nigeria,the girls are well known.They are flown all over the country in private jets and most of their customers are said to be rich Alhaji's. Not only that,the girls who regularly flaunt their wealth on social media outlets like Instagram and snapchat,regularly have spats online with other girls who call them out and label them as whor.es. 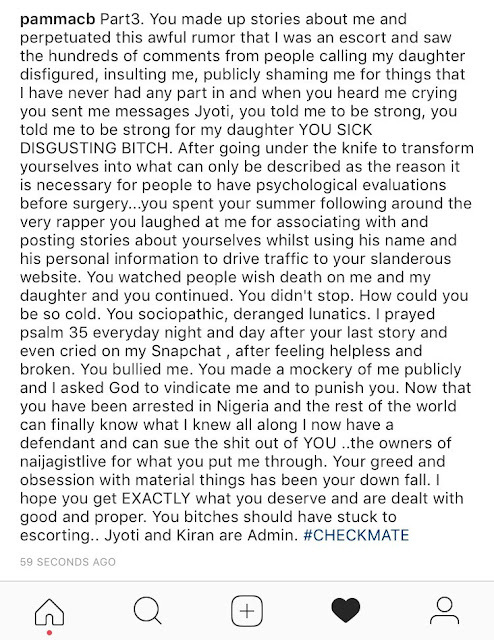 One of the sisters famously had a war of words with Caroline Danjuma who is married to billionaire Musa Danjuma.It got real messy as there were news all over the net that the particular sister,Jyoti was seeing Caroline's husband. SEE SAD PHOTOS OF THE SISTERS IN COURT LOOKING LIKE CRIMINALS AT THIS LINK. But the activities of the Canadians finally came to an end with their arrest and as we are speaking,they are languishing in jail. Having used their slanderous and shadow website, naijagistlive dot com, to successfully blackmail and torment the crème of Nigeria’s affluent males who couldn’t keep their member in their pants, for a long while, the sisters soon shifted their gaze to Otedola and honed in on him, hoping he would fall to their wiles and into their trap, like many of his peers. They were lured by Otedola and his detective team to Eko Hotel were they were arrested. A host of influential names of top men in society were discovered,thanks to sophisticated devices the Matharoo sisters had used to record these men without their knowledge.These dirty and top secrets gathered at these vulnerable times and meetings are what the girls used in extorting money from these men. The most shocking discovery of all was that of the amount of money they had raked in so far from their dealings.kiran and jyoti had made almost a million US dollars from their game! Jeez!Who says crime does not pay? WATCH VIDEO OF THE TORONTO SISTERS ADMITTING EXTORTION IN GROVELLING APOLOGY HERE. 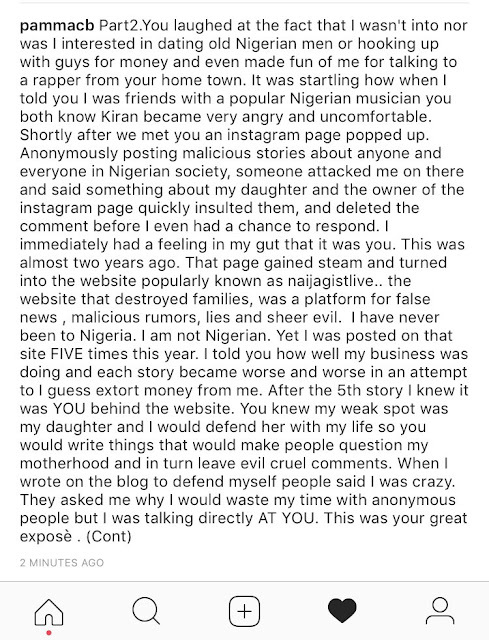 However,someone who is yet to reveal him or herself has come out to deny that the sisters are not the ones behind Naijagistlive.I guess they don't want the site closed cos it is a moneymaker as well.